Our Sideline Yarn Dye Rugby is a yarn dye jersey featuring a cotton drill collar and hoop stripes in the Vodafone Warriors’ foundation colours; an on trend look to suit any casual occasion. Canterbury’s Sideline Yarn Dye Rugby is the perfect way to show your support in a smart casual garment. 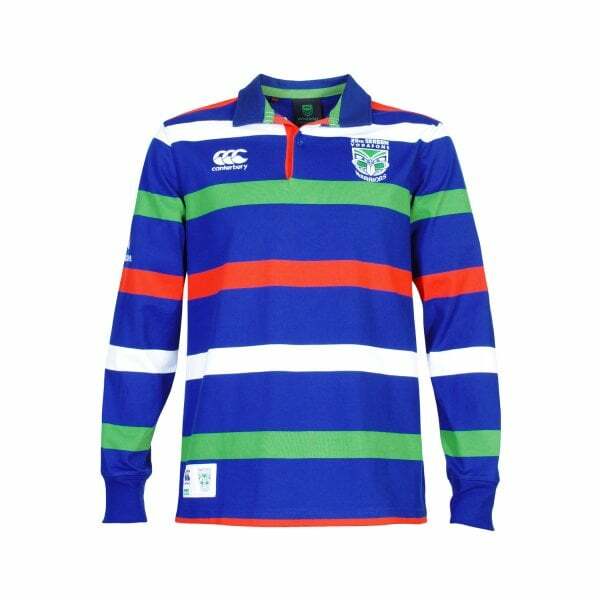 This long sleeved yarn dye rugby jersey has a cotton drill collar and features horizontal hoop striping in the Vodafone Warriors 1995 foundation colours of red, white, green and blue. Made from a soft polyester and cotton mix, it ticks all the right boxes for comfort, quality and casual style and would make an ideal inclusion in any supporter’s wardrobe. As part of the 25th Season Supporters range, celebrating the team’s 25 years in the NRL, it’s a must-have for serious Vodafone Warriors fans.